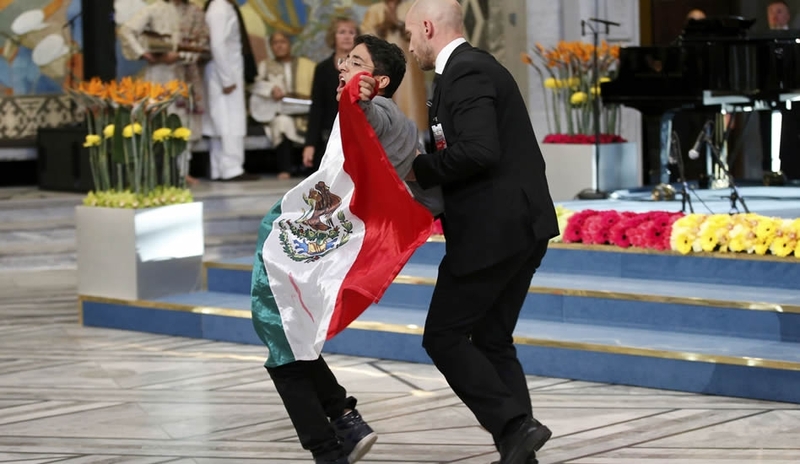 Adán Cortés Salas, student of International Relations at the School of Political and Social Sciences of the National Autonomous University of Mexico (UNAM), interrupted the ceremony of the Nobel Peace Prize held in Oslo on Wednesday December 10th, 2014; and displayed a Mexican flag on the stage for a few seconds to protest over the disappearance of 43 students of Ayotzinapa teachers training college, missing since September 26. 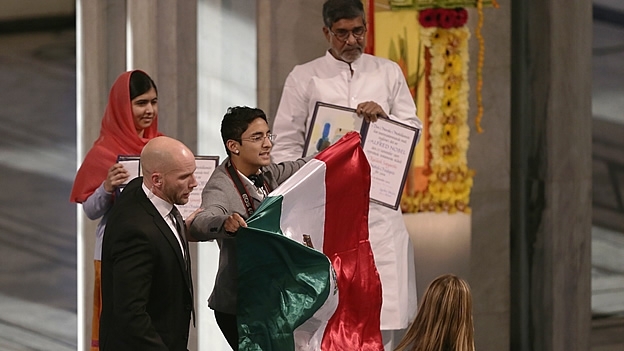 The incident took place while Malala Yousafzai, a Pakistani teenager and Kailash Satyarthi, President of the Global March Against Child Labour, received the Prize. The youngster, identified as Adán Cortés Salas, studies International Relations at the School of Political and Social Sciences at the National Autonomous University of Mexico (UNAM). 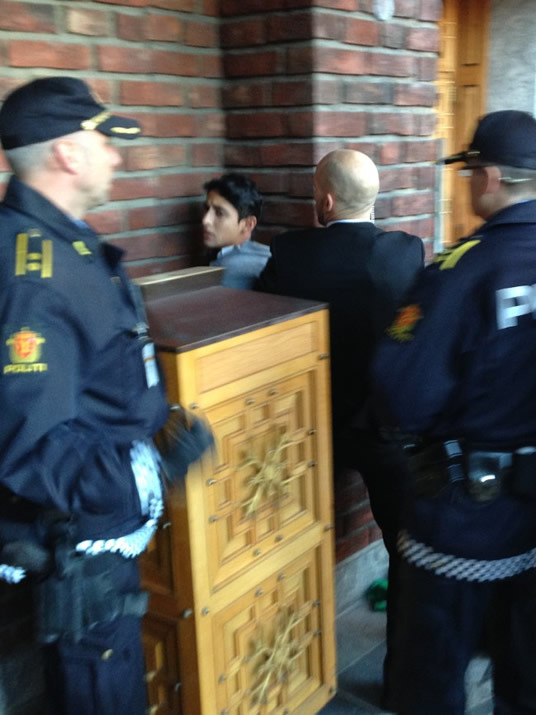 The 21-year-old was fined 15,000 kroner (US$2,100) for disturbing the peace and sent back to an asylum center. His family said that the fine was paid by an anonymous “angel”. Austin Cortés Salas, twin brother of the activist who interrupted the Nobel ceremony, said that the plan of his brother was to remind the world the case of the missing students of Ayotzinapa. Cortes, declared later on that he would do it again. “This is the first time I am arrested and also the first time I behave this way. I prefer to do everything according to law, I am not a troublemaker,” he said in an interview with the Norwegian broadcaster NRK. “Sorry if I scared people, sorry if I caused problems to the security staff.” he added. The student of International Relations at the UNAM clarified that he does not belong to any student organization, but he is part of the thousands of Mexicans who are angry about the current situation in the country. Recounting his experience to enter the official ceremony in Oslo, he said that although there were security filters he entered as a guest. “Maybe it sounds weird, but I just got to the main entrance as a guest. I felt very confident and I said to myself: no matter how you do it, but you will enter” he said. “I was in line and passed through security filters, metal detectors, the wardrobe, and then I was there. I tried to look relaxed, I knew I had no permission to be there. It was easy because I looked like a guest and was confident of myself.” he added. The young man explained that he intended to approach the laureates to denounce the disappearance of students in Mexico, so he wanted to use the microphone.